If you’re working with on a complex enough business process then at some point the process diagram will become bloated and unreadable. This means it’s time to make hierarchical decomposition - in simple words, split the process to subprocesses. The old rule of having 5 to 9 activities per level is fully applicable to BPMN. Definition 1: Orchestration - a diagram depicting a sequence of activities coordinated from a single center of control. Synonyms to orchestration are workflow and, in fact, process. Orchestration is modeled by a white-box pool in BPMN; it may also contain optionally black-box pools presenting external entities. The phrase “coordinated from a single center of control” means that even if a process diverges at some point, the branches remain coordinated e.g. they can be synchronized later in a converging fork; the whole process will end when all branches are completed. Definition 2: Collaboration - a diagram showing interactions between processes. In BPMN 1.x interprocess communication was called choreography. In BPMN 2.0 choreography is reserved for a totally new type of diagram - what used to be a choreography in BPMN 1.x is called collaboration now. So it goes. A collaboration diagram contains more than one white-box pool. Some people reduce collaboration to the exchange of messages but generally speaking, processes may communicate via messages, signals and/or data (data store, conditional event). 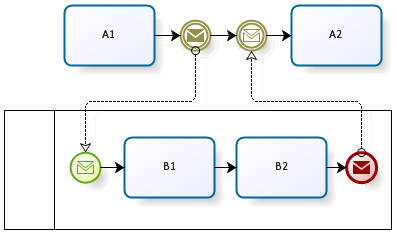 Processes on a collaboration diagram are executed independently except specific sync points where messages and signals are sent/received, data read/written. The big BPMN advantage is its support of collaboration as well as orchestration. This is also a key criterion for choosing a BPMS. Yet as my BPMN training shows, the right balance between orchestration and collaboration is tricky. At a first approach to BPMN analysts try to do the job with orchestration only. Yet it works only for very simple processes like vacation request. Cross-functional processes that are of greatest interest for the business are multi-threaded by nature and hence can’t be modeled within orchestration. “This process is performed by another entity.” - Use swimlanes not pools to show a performer. “The process can be called from several points.” - So do reusable subprocesses. Rule 1. If your attempts to model a process are unsuccessful because some significant aspects are missed repeatedly then stop and think - maybe in fact it’s not a single process but two or more? Rule 2. Do not overuse collaboration - stay within the orchestration as long as possible. Never introduce collaboration into a diagram just because you’ve recently learned how to do that. In the following article I’ll share my experience of identifying independent processes during analysis. Ivo Velitchkov made me pay attention to the difference between BPMN 1.x и BPMN 2.0 in respect to data flow modeling. 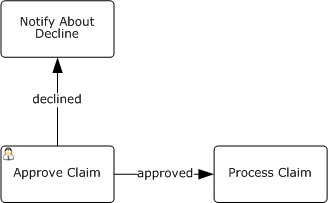 BPMN 1.x Data Object is an artifact used to inform what a process does. With the help of Association it may be linked to a Task, Control Flow or Message Flow yet it won’t directly affect any of them. Data Objects can model a range of physical or electronic objects. We may for example drop a Data Object outside a pool and label it “Orders Database” in order to model interprocess communications via data. Yet as Ivo rightfully pointed out the diagram depicted above becomes illegal under BPMN 2.0! The point is that Data Object is associated with a process context in BPMN 2.0: it is drawn within a process (subprocess) boundary and it only exists from a process (subprocess) instance start to end. Therefore it can’t be accessed from the external process. As a side note, BPMN 2.0 makes a difference between single-item data objects and collections - the latter carry a special marker. It also introduces special markers for Data Inputs and Data Outputs and new elements - Input Sets and Output Sets. 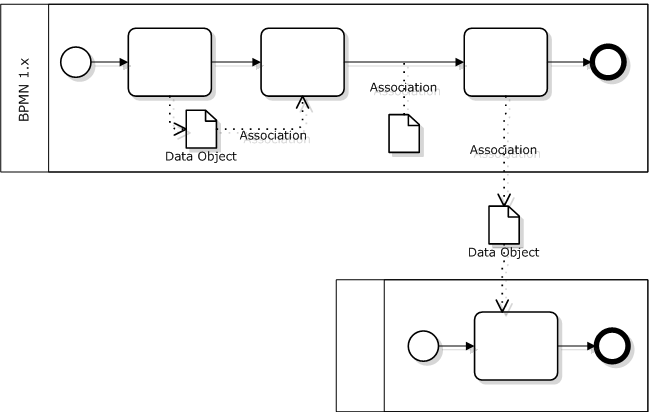 BPMN 2.0 also defines Data Association in addition to the general Association inherited from 1.x. 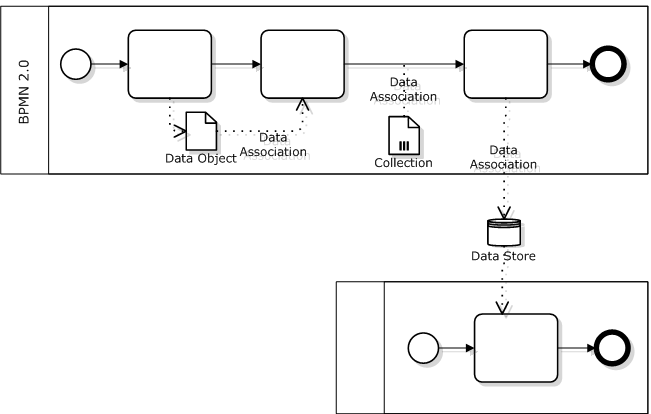 While general Association serves documenting purposes only, the Data Association is “executable”: one may define source, target and optionally transformation at the model attribute level. One may define right at the model the data manipulations that should be performed at activity start and end, message send and receive. Visual representation remains the same: dotted line with V-shaped arrow. P.221 says that Data Association is used with Data Objects without mention of Data Stores. Since Data Objects always belong to a process, one may conclude that Data Associations should never cross a pool border. This rule would make the second diagram illegal - please refer to Ivo Velitchkov’s comment. Yet p.208 says clearly that Data Store may serve as input or output for a Data Association. So I believe that the diagram at fig.2 is valid. Besides, even if you or your tool has objections against using Data Associations with Data Stores then you still can use plain old Associations that look exactly the same. Synchronous - the performing unit starts work as soon as it received an internal order. Technically it’s implemented by a single process. Asynchronous - orders are first accumulated in the input buffer unit of the performing unit, then extracted and processed with some frequency. Technically it’s implemented by two (when there is a single resource) or larger number of processes. Synchronous mode grants minimal process execution time while asynchronous maximizes the performance (measured by the number of process instances completed per unit of time). According to my observations asynchronous mode prevails in real life because departments and people both feel more comfortable when they are not chased by a continuous flow of a variety of tasks but have an opportunity to somehow organize and plan their activities. Business and process analysts prefer synchronous schemes - not with something special in mind but because they just follow the path of least resistance: these schemes are plain simpler. This may lead to conflicts at the process implementation: people are pushed into the process framework which they feel uncomfortable. Now if we look at it from the organization’s goals perspective (i.e. process performance) then the synchronous scheme is preferred because it provides the highest quality of customer service. A performer may not feel comfortable but it doesn’t matter on the condition that he/she isn’t overloaded (which does not happen as often as it may seem). Improving an individual’s performance may be a sub-optimization which is a bad word. It’s time to pay the debts - returning to cross-functional processes modeling as promised. Remindment: the first part stated that it’s usually impossible to implement cross-functional processes by orchestration only (i.e. within a single BPMN pool). The borders betwen departments are material, they mark differences in manner and rhytm of different kinds of work. Because of these differences the fragments of a process belonging to each department are technically implemented by separate pools while the cross-functional process as a whole is implemented by a set of such pools communicating via messages and data. In this article we’ll consider common cross-functional process patterns. Under routine financial planning all bills received by a company are processed by the finance department first: they determine validity of the claim, check the amount and date, assign priority in accordance with established business rules. Then the bill is submitted for approval to CFO or some other manager who makes a decision about payment taking into account priority, amount and term. Unfortunately, the question “how to model human decisions in BPMN” isn’t frequently asked. After exiting the “Approve Claim” task the process will continue in parallel on the outgoing flows whatever is written on them. 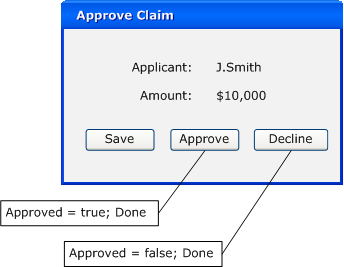 It’s implied that the process has a boolean attribute “Approved”. 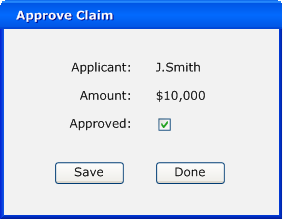 User sets this attribute at the “Approve Claim” task, the gateway checks its value and the process continues in one of the flows. As you can see, BPMN authors didn’t provide a special construct for human decisions but implemented them rather artificially: a special attribute that must be set by a human and checked in the gateway immediately after. When “Done” button form is pressed the task is completed. I agree with Keith Swenson that BPMN misses explicit support of human routings. Firstly, human-based and automatic routings look alike at a diagram. Yet this is an important aspect of the process. The existing flow types - Control Flow, Conditional Flow and Uncontrolled Flow - are extended by Human Controlled Flow here, marked with a double dash. Another issue are screen forms like the one above which provoke user mistakes: it’s tempting to press “Done” and get rid of the task without paying attention to the attributes. The buttons could be generated automatically from the process diagram above. 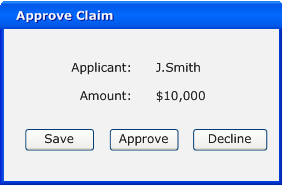 “Done” button is replaced by “Approve” and “Deny” here, each of them being bound to two actions: set the attribute value and complete the task. Now I’m going to use this occasion to appeal to BPMS vendors: please give the opportunity to create more than one button completing the task and bind them to attributes. If you didn’t do it yet, of course. Here is a test for my readers. The diagram illustrates a fragment of book creation process. The process splits into two subprocesses executed in parallel: writing text and developing book cover. The point is that book cover development may start only when the concept is ready. The challenge of implementing this logic is that we can’t use sequence flow because it cannot cross subprocess boundary. (Let’s leave apart the question why we need subporcesses here; let’s just suppose we need them for some reason.) We can’t use message flow either because it’s all within a single pool. It’s so called “Milestone” process pattern. A similar example of BPMN signal usage is given in the book by Bruce Silver, “BPMN Method and Style”, p. 98. Everything is OK as long as we consider a signle book creation. Now let’s suppose several books are processed at once. Recalling that BPMN signal is broadcasted to everyone awaiting it at the given moment, as soon as the concept of first book is ready all designers will receive the signal to start developing the cover. Not exactly what we expected. In order to make the diagram work we must limit the signal propagation somehow. How it can be done? The first thing that comes into my mind is an attribute that would limit signal broadcasting by the current process instance boundaries. Yet there is no such attribute in the standard. Under BPMN 1.x one may say that it’s implementation issue not covered by the standard. But BPMN 2.0 fully specify the process metamodel. Let’s look at page 281 of OMG document dated June 2010: signal has a single attribute - its name. Therefore, a signal will be transmitted to all process instances. If the signal has only name then let’s use what we have. The diagram above may work if we could change signal name dynamically i.e. during the process execution. If we could name the signal “Process 999 Concept Ready” instead of “Concept Ready” then everything will be fine. But it’s a dirty hack and it’s hard to count on it. BPMS engines allow to change certain things during the execution (e.g. timer settings) but unlikely the name. The BPMN standard lacks an attribute giving an option to limit signal event propagation. As long as there is no way to limit the signal propagation, the “Milestone” process pattern should be implmented by message flows between separate pools. Within the first scheme an employee sees a task in his list: “Do It. He does, then presses the button and… after 15 minutes he sees the same task belonging to the same process instance. It’s confusing, especially if he managed to work on some other things during these 15 (or 30, or 130) minutes. The second diagram is also better from monitoring perspective: it’s easy to calculate the number of “Redo” executions and the total time spent for them and then focus on bringing them to zero. OK, the number of redo’s can be calculated within the first scheme too - by subtracting the number of process instances from the number of task executions. Yet the total time spent (i.e. unjustified costs) won’t be so easy to calculate within the first scheme. So that’s the pattern: almost trivial yet (or therefore?) widely applicable.